You'll Buy Your Next Couch Online | Valet. Call it the Casper effect. A few years ago, the idea of buying a mattress online, without ever having laid on the thing, would've been considered crazy. But now there's a range of modern mattresses that have made upgrading your bed easy and efficient. Now, the theory is spreading from the bedroom to the living room with the launch of Burrow. The USB and power outlet cradle, conveniently hidden underneath the sofa. 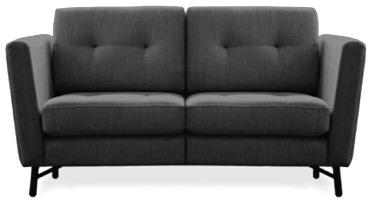 The Philadelphia-based company has created a good-looking and affordable sofa that ships direct to your door. It's packaged in a few manageable boxes and was designed to be assembled in as little as ten minutes without any special tools. Which also means that moving it out of an apartment (and down the stairwell and into a moving truck) is a whole lot simpler too. As for the design, the company is starting off with one style, available in two sizes. You can select the fabric and color combination and soon, you'll be able to choose different arm and leg styles as well. But the core of the couch is a mid-century inspired piece with clean lines that's as comfortable as it is tailored. Going above and beyond the average sofa, Burrow's fabrics are supremely stain-resistant and hidden underneath is an ingenious power cradle with USB and power outlets. Add all that to the ease of obtaining and assembling, it's clear that what we have here is the couch of the future that is right at home in the here and now. A hallmark of those modern mattress brands, Burrow's doing it too. If you don't like the sofa, you've got three months to return it for free, no questions asked.